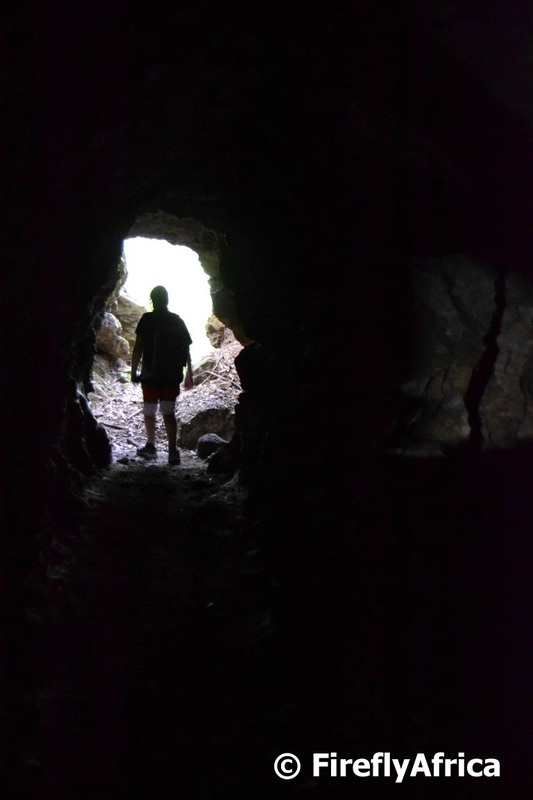 I snapped this pic of one of the boys at Chaos Boy's birthday party as he walked out of one of the mines at Sleepy Hollow where the party took place. I just liked the shot for some reason. I was in Cape Town a week or so ago when the Queen Mary 2 visited the Port Elizabeth Harbour. Man, I would have loved to see her and to take a picture to share with you. Cue Gerhard Burger. Gerhard dropped me a mail last night to say that he always enjoy the pictures on PE Daily Photo and to show me this one he took of the Queen Mary from Fort Frederick. I am posting it for your pleasure with Gerhard's permission. Stunning pic, isn't it? I took a walk along the beachfront during lunch time one day last week. Autumn is my favorite time of the year. The edge is off the summer heat and even though the evenings are starting to get slightly colder, winter isn't quite here yet. The best part for me about this time of the year is the fact that we have very little wind. Something always welcome here in the Bay. 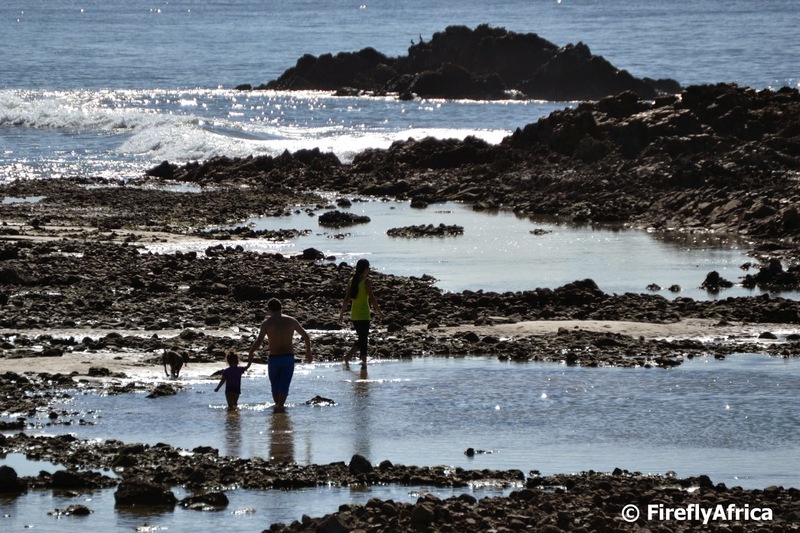 While heading back towards Hobie Beach I spotted this family walking through the rock pools at low tide. Precious beach time before the cold arrives. This last of the photos I took on an outing with the Sundays River Valley a little while ago. This is the view down to the river from the crest of the first dune. 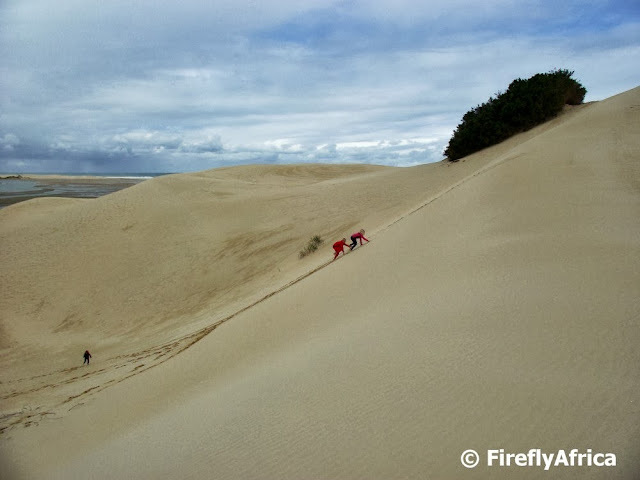 Take note, the first dune and not the highest one yet. Only about a quarter of the way there. 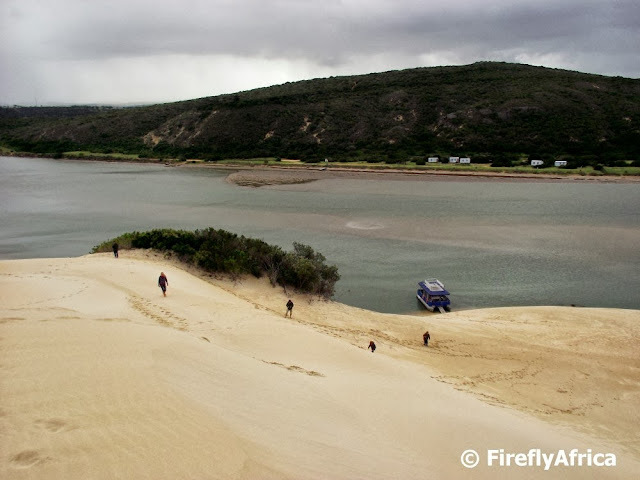 The Sundays River Ferry pulled up to the dunes for the passengers to climb to the top to enjoy the surrounding view. Can you believe that its been almost a month since we had the Standard Bank IRONMAN African Championship here in PE? Just show how time flies when you're having fun. We were out on the cycle and running route but its impossible to take in everything on the day. Check out what you missed elsewhere or on the whole if you weren't around. One of my favorite things to do in the PE area. Cruising down the Sundays River to the sand dunes. With all the sad things going on in this beautiful country of ours I posted the following on Facebook yesterday and decided to repost it on the PEDP blog today. I know its not Port Elizabeth being featured specifically, but it has all the relevance in the world to all of us. There has been many memorable speeches in history. Martin Luther King's "I have a dream", Winston Churchill's "We shall fight on the beaches", Emmeline Pankhurst's "Freedom or Death" and Nelson Mandela's "I am Prepared to Die". My favorite speech is "I am an African" by Thabo Mbeki in 1996 on the occasion of the passing of the new Constitution of South Africa. Perhaps all the xenophobic, poo flinging, statue bashing, racism spewing, fellow man hating, aggressive people, both black and white, in South Africa should just go, sit down and listen to this speech carefully. I, Jonker Fourie, am an African. I may be white and of European descent, but I am an African. I usually am proud to be an African, but right now I am ashamed. Ashamed and sad about what is going on in this beautiful and proud country of ours. I am an African. 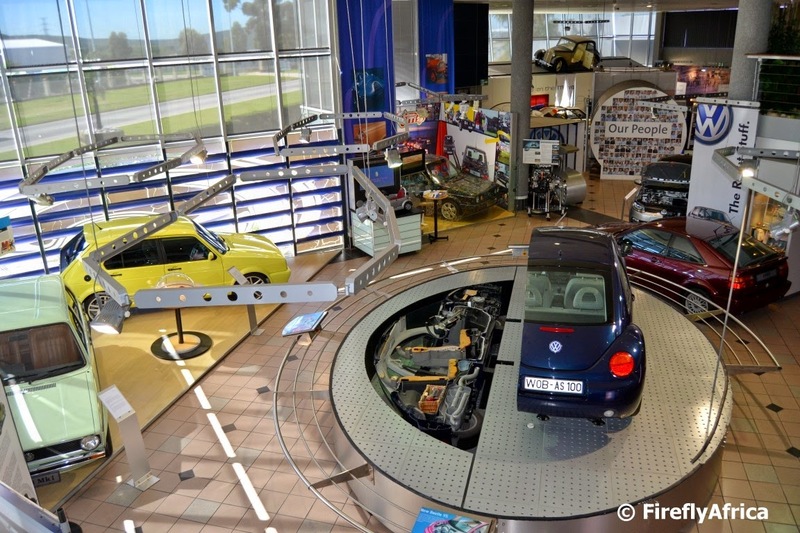 The last South African-made Volkswagen Beetle came off the production line on 18 January 1979 and went straight into the Volkswagen museum which later became the VW AutoPavilion. The metallic bronze Beetle was the last of 288 353 built at Uitenhage plant 1951. The car only had 200km on the clock when a vehicle carrier overturned on the way back from a show in Cape Town in 2006, destroying nine of the AutoPavilion's most important historic cars, including this one. It was decided though to painstakingly recreate the car (recreate and not restore as the body was totally written off) using as many parts of the original as possible. 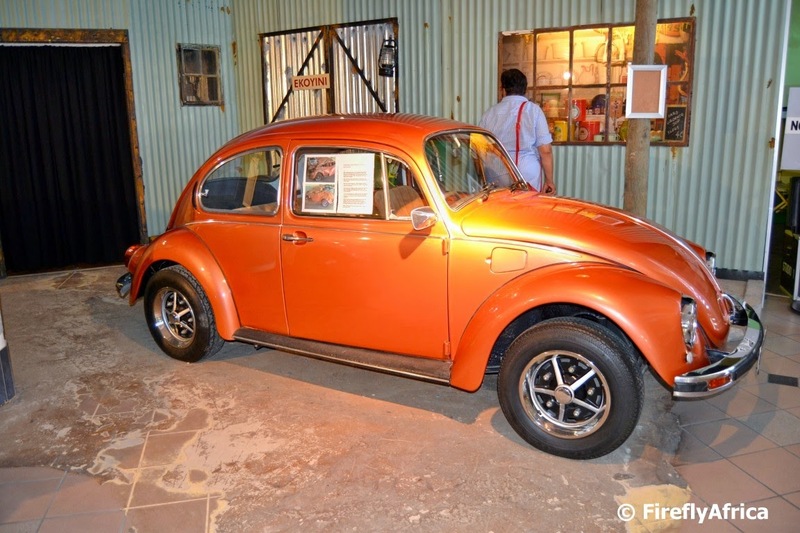 The car is one of the exhibits in the VW AutoPavilion's collection which can be viewed when visiting this awesome museum in Uitenhage. 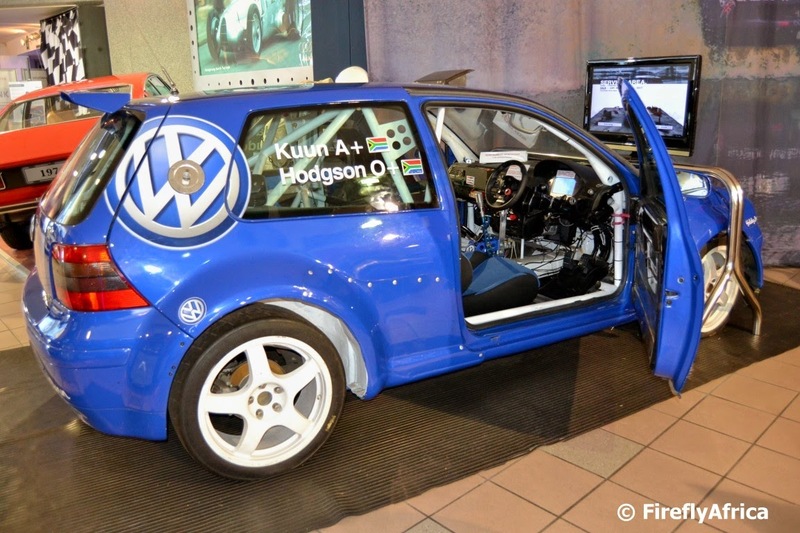 One of my favorite geocaches done lately was one located inside the VW AutoPavilion in Uitenhage. The coordinates take you to the museum itself from where you have to follow the instructions in the cache description. These tell you to look for the blue racing car and to get in to find the cache. I'm giving this one away a bit, but the container is muggle proof so doing so isn't the end of the world. The cache container turned out to be a ammo can in the shape of a first aid kit located somewhere in the car. Its secured to the car so no muggle can move it and its locked with a combination lock to secure the content. It had some very nice VW and car related swag inside and once I signed the logbook I spent some time enjoying the simulator in the car. A very cool cache by Navimate and well worth doing if you are a Geocacher. 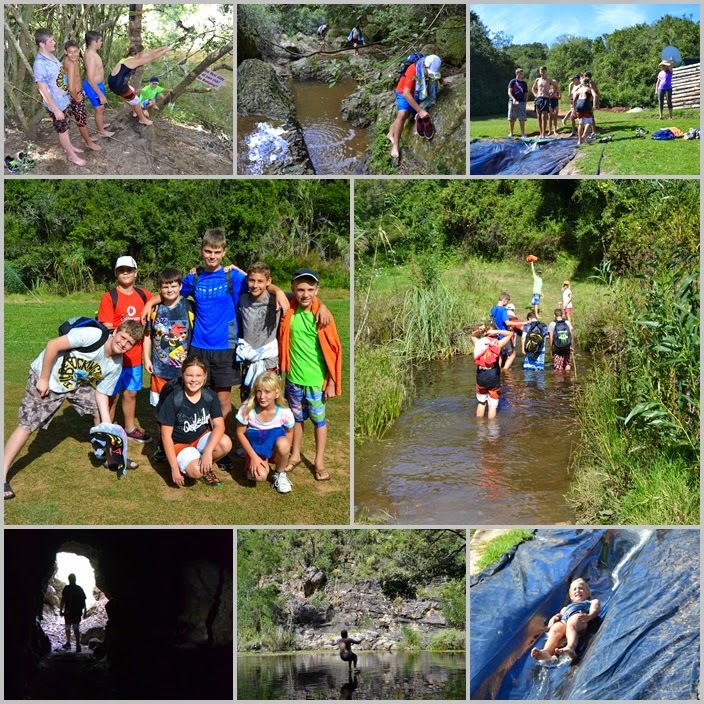 I found this video on YouTube posted in 2013 by Brad Taylor of him and his dad snorkeling in a gully in Schoenmakerskop. To their surprise they were joined by an otter. Now there's something that doesn't happen every day. 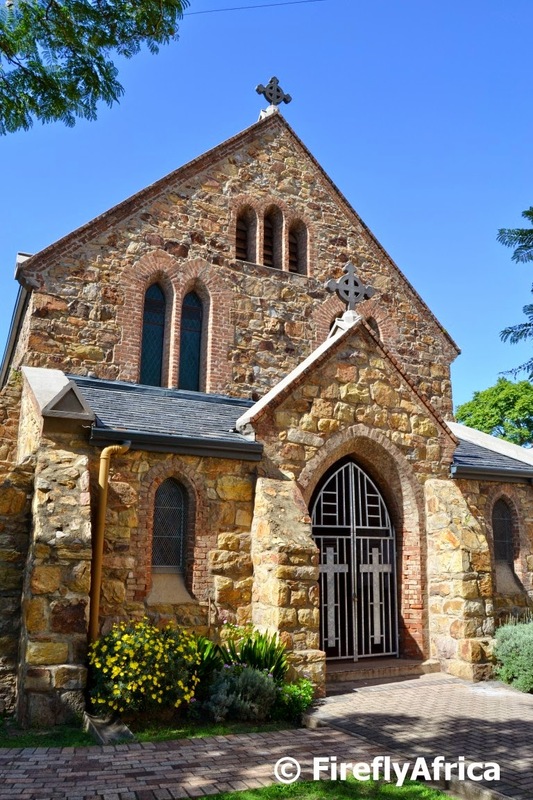 A little caching expedition took me to St Katharine Church in Uitenhage the other day. The foundation stone, which cannot be found today, was laid in 1867 and it is from this date that the anniversaries are counted, although the building (as in construction) only began in 1869. It was completed in 1875 after many financial constraints and problems and dedicated that same year by Rev. William Llewellyn. It was named by him after St. Katharine, an eighth century Egyptian Princess who was beautiful and wise. In 1894 the chancel was added and the original galvanized iron roof was replaced by the slate roof in 1966. The church is built in a simple Gothic architectural style with stones quarried from the vicinity of the farm “Hillwacht” and transported by ox-wagon to this site where Muslim stone masons built the original structure. So who was St Katharine? The VW AutoPavilion in Uitenhage doesn't just have some awesome exhibits inside the facility, there are also a couple of outside exhibits. One of them being this replica roadhouse and garage. A quick trip out to Uitenhage to fetch my drivers license had me pop into the VW AutoPavilion briefly and even though I was in and out quickly I just realised again how much of a world class attraction it is. 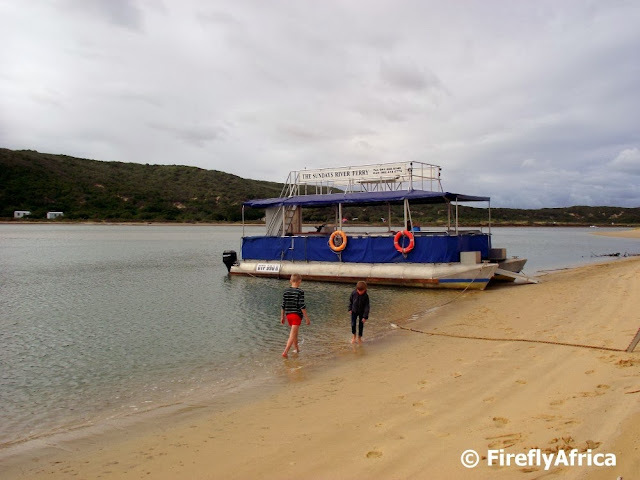 We really are very fortunate to have it right on our doorstep but I often wonder how much more popular it would have been if it was in Port Elizabeth and able to attract more visitors. 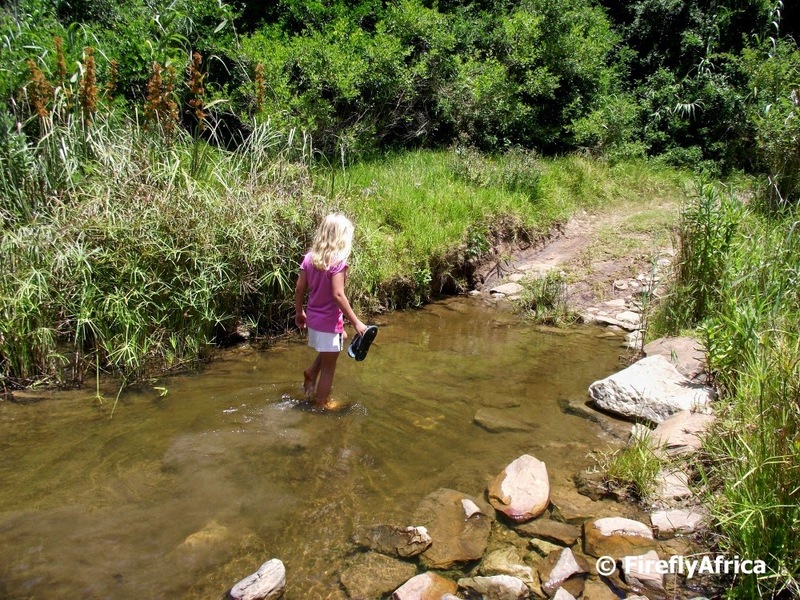 Locals tend to be a bit on the lazy side to travel to Uitenhage (I also joke that some people probably pack padkos when they drive out there) while most tourists and holiday makers probably never get anywhere close to The Hage. For those who don't know what the AutoPavilion is, it is Volkswagen of South Africa's high-tech, interactive expo and heritage centre. The centre features state of the art technology and unprecedented interactivity and thoroughly showcases the evolution of the VW brand from the very first Beetle to the contemporary passenger and sports cars of today. 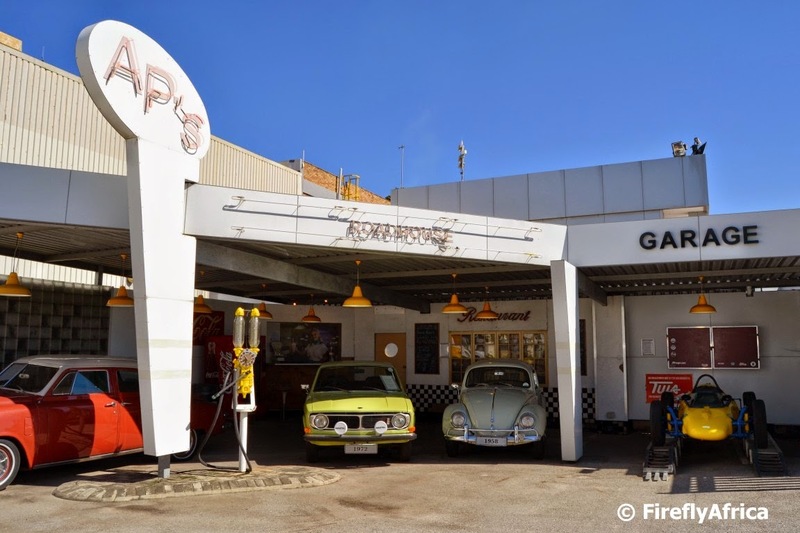 You get to travel in an interactive "movie studio" Beetle complete with green screen technology, drive in a simulator, see icons of yesteryear such as Herbie or South Africa's oldest kombi or check out a Beetle cut in half by a laser. These are just a few of the amazing attractions at the AutoPavilion. Never been? Make a plan and go for a visit. Did you know that Port Elizabeth is the mohair capital of the world? South Africa produces 53% of global mohair production and together with Lesotho produces 70% of world production. The majority of the world's mohair gets processed in two plants in the Eastern Cape while there are two dedicated mohair spinners within Nelson Mandela Bay. Port Elizabeth is also home to Mohair South Africa and it is here where most of South Africa's mohair gets handled and exported from. 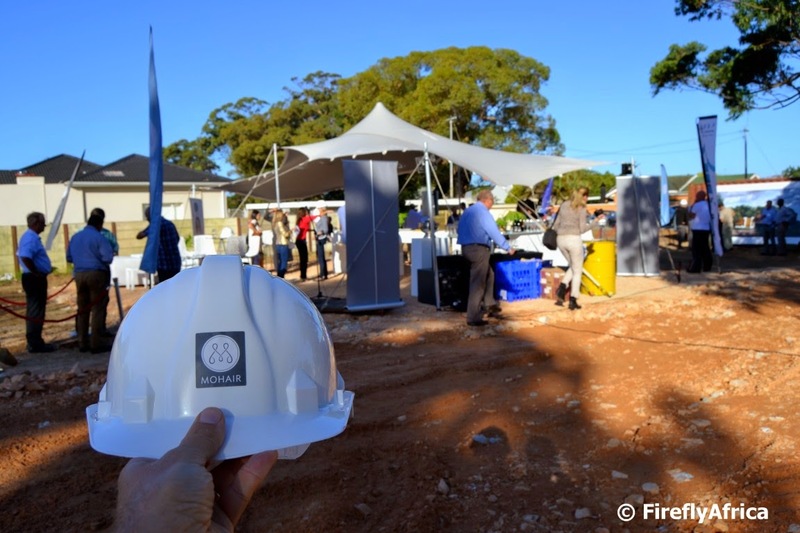 Last Wednesday I attended the groundbreaking of the new Mohair South Africa headquarters in Walmer right here in the Friendly City. 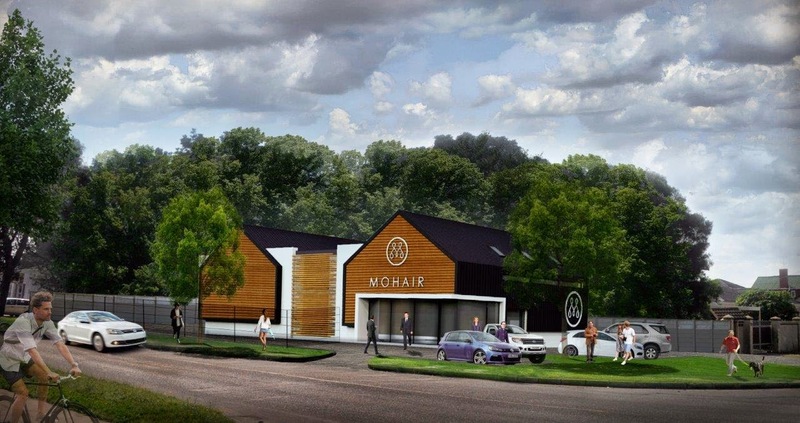 Other than Mohair SA's head office, the building will also include a retail space, where an array of mohair products, produced both locally and abroad, will be available. There will also be a mini conference centre as well as provision for a mohair library and crafting space to be utilised by students. 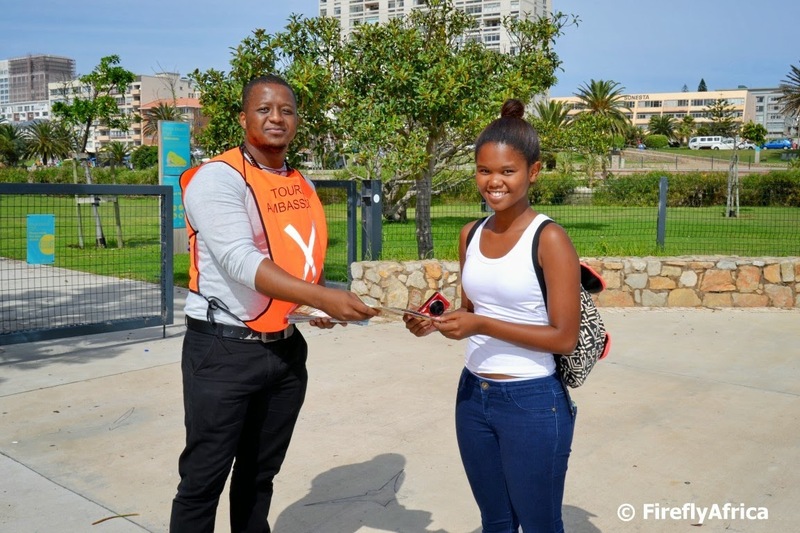 Last Sunday while in the Kings Beach parking area after a walk on the beachfront, I spotted a group of youngsters with orange bibs that had TOURISM AMBASSADOR on it. I was curious and snapped a picture of them as they passed with the idea of asking my friends at Nelson Mandela Bay Tourism what it was about. The one guy saw me and came over to chat and offer some information. Turns out that they are part of a project by the Eastern Cape Parks and Tourism Agency and go around tourism hot spots with maps and visitor guides, offering information to visitors. The guy was a very friendly and eager chap but I doubt he would have been able to tell me anything I don't know. It was awesome to see them there and to hear that there is such an initiative on the go again. Now I hope its an on-going one and not just one to tick another box. 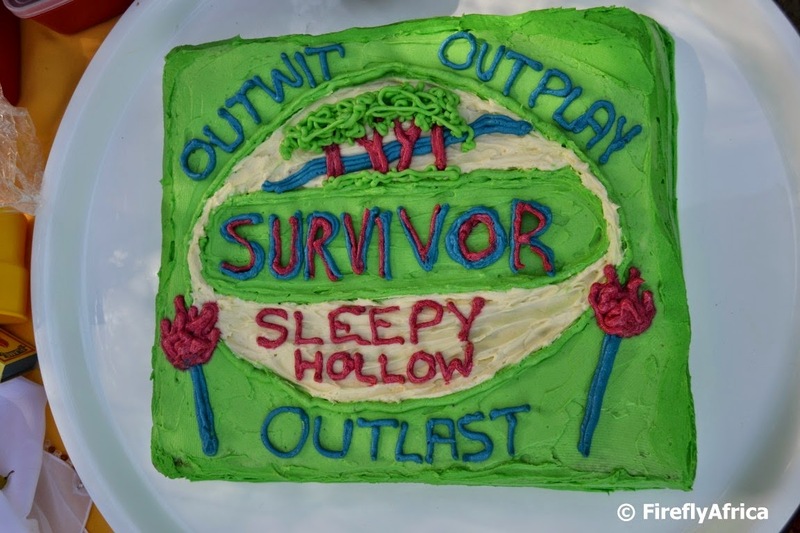 Chaos Boy turns 13 today (I can't believe he's a teenager now) and he wanted to have an outdoor "Survivor" party. 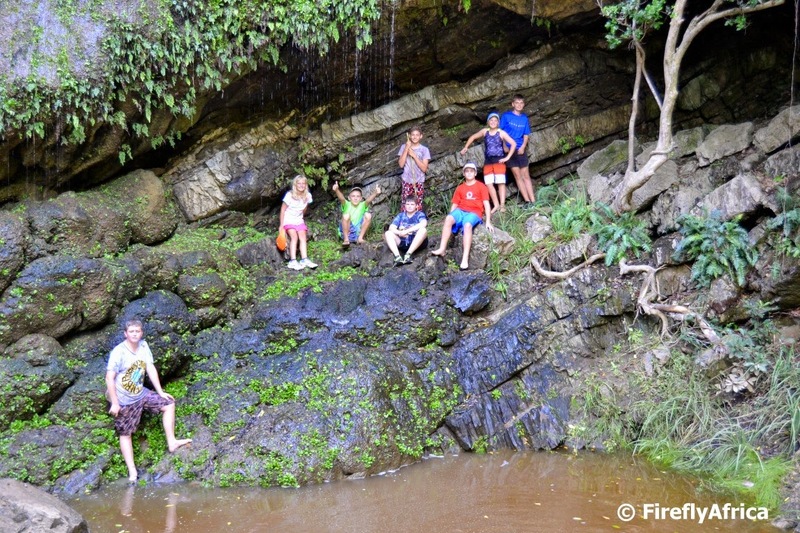 We decided that the best place to have an outdoor party would be at Sleepy Hollow and this morning we headed out there with eight kids for a day of hiking, swimming in the Maitland River's pools, foofy sliding, slippery sliding and exploring the old mines. After posting about the raising of the giant South African flag on the Donkin Reserve last week, I thought of a video I saw a little while ago of the flag being taken down on a day when the wind was pumping. I found it and decided to post it for your pleasure this week. Check our the Prince Alfred Guard soldiers struggling to get the flag under control. More importantly, check the size of the flag. When it flies 65 meters up on the flagpole people don't want to believe they get told that the flag is 10 meters by 15 meters in size. About the size of a tennis court. The last stop on the Mohair Factory Tour in Uitenhage is the Mohair factory show at Hinterveld. 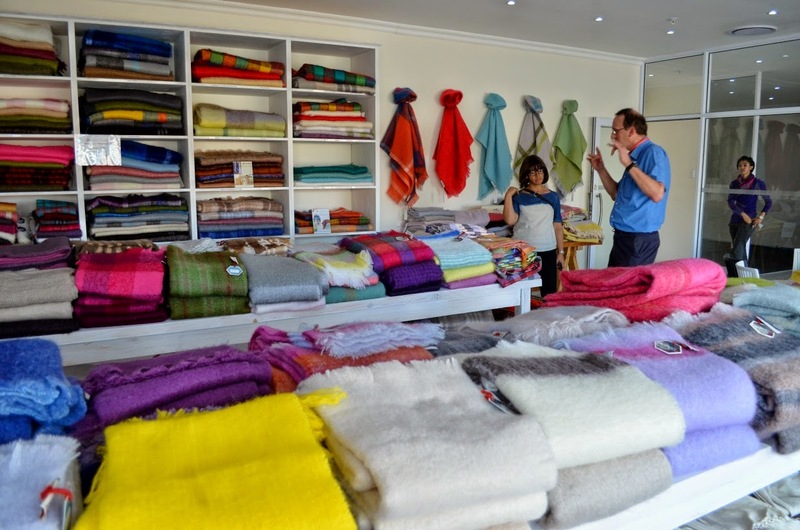 Open to the public, this shop sells labeled mohair products that retails for a lot more in other shops and often gets exported to fashion retailers and designers in the UK and other countries. Yesterday I attended the groundbreaking of the new Mohair South Africa headquarters in Port Elizabeth (I'll still post about that) and found out to my shock that the Gubb and Inggs Factory where a big part of this tour takes place burned down on Sunday. Devastating news, specially to the mohair industry in Uitenhage. Some of those machines were over a hundred years old. It obviously doesn't just affect the operation but also the tours which would not be available for a while. The factory shop will still be open though. 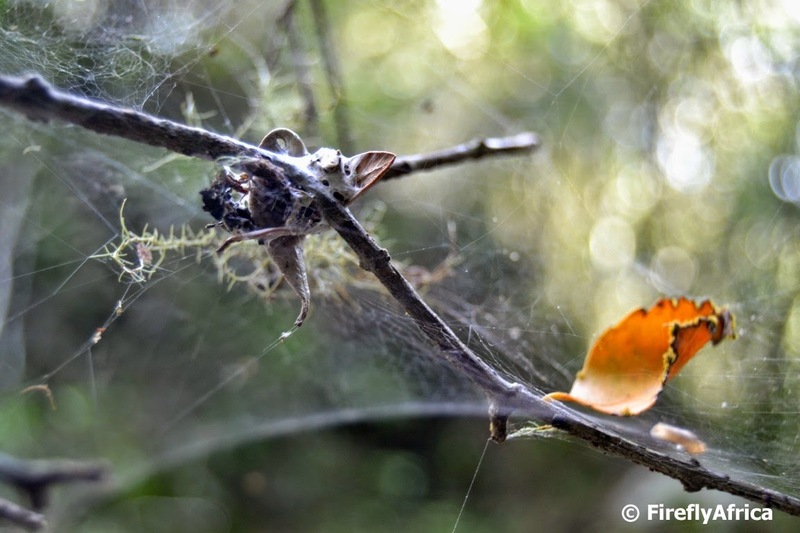 Ever wondered how yarn is spun? 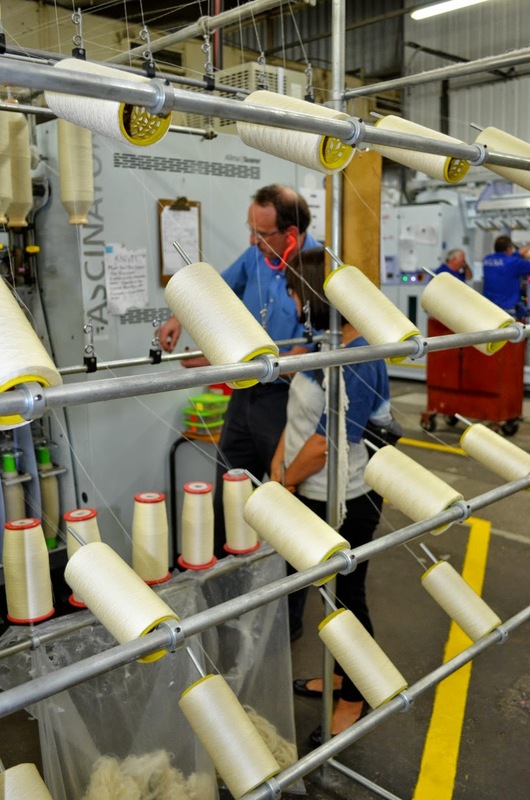 It is one of the things you get to see while on the Mohair Factory Tour in Uitenhage. This section of the tour is through Mohair Spinners South Africa and is probably the most interesting part of the tour when it comes to "fancy machinery". The machines even know when the yarn breaks, grabbing it and weaving the two pieces together again before continuing. Fascinating. Remember the bales of raw mohair arriving at the factory I posted on Sunday? Well, these are the bales of clean mohair that gets exported after the whole cleaning process has been completed. 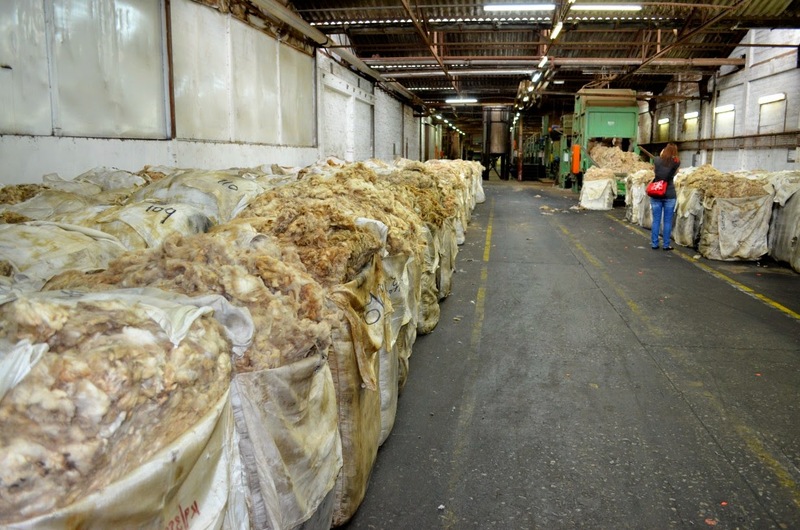 In the first picture of this series of pictures from the Hinterveld Mohair Factory Tour in Uitenhage showed the raw mohair as it comes in from the farm. From there it goes through a washing and drying process. The washing process takes the mohair through two baths where a machine with "spider" legs makes sure it gets dunked and washed properly. They then come out at this spot in the picture before being sucked into the drying pipes. I don't think people ever wonder how the mohair gets cleaned. I came across a folder with five pictures taken at Hinterveld in Uitenhage during a Mohair Factory Tour which for some reason I never posted. Oh well, better late than never. 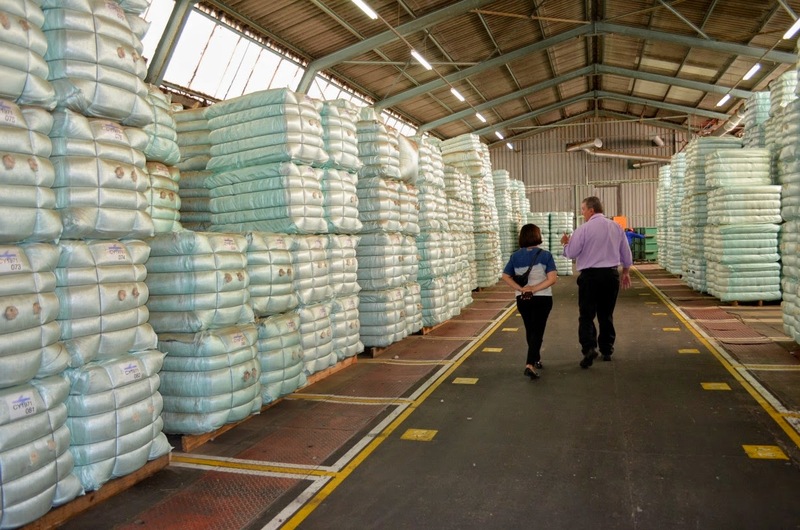 At the start of the tour you get to see the bales of raw mohair as it arrives at the factory for processing. 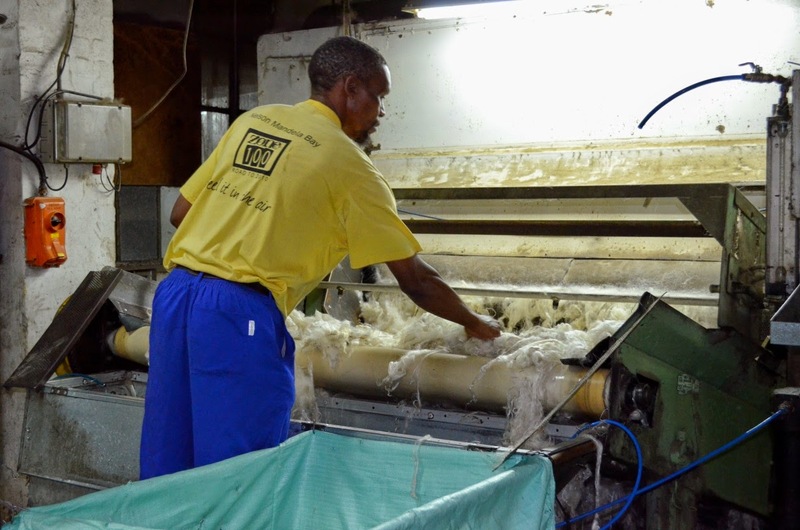 The washing, drying and combing process takes place at Gubb & Inggs, one of three factories (the others being Mohair Spinners South Africa and the Hinterveld weaving factory) that make up the whole process. The 60th SAP 5O5 sailing World Championships took place in Port Elizabeth this past week. 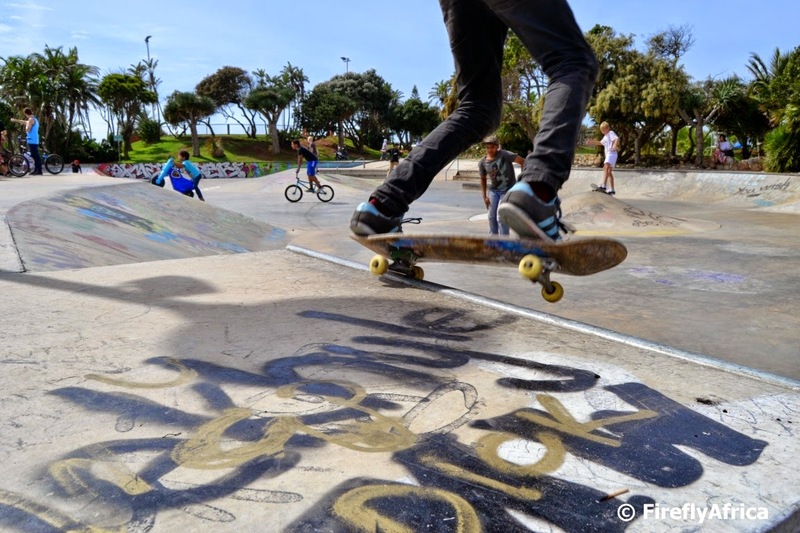 The opening ceremony took place on the Donkin Reserve with the Prince Alfred's Guards raising the country's largest flag on the 65 meter tall flagpole next to the Donkin Lighthouse and Pyramid. 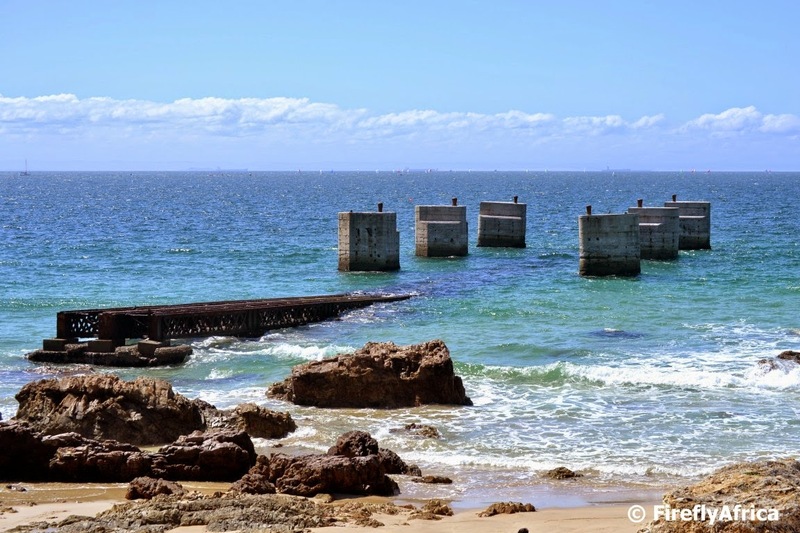 The Humewood Slipway must surely be as well known a beachfront landmark as Shark Rock Pier is. The difference being that most people probably don't know what it actually is. The iron and cement structures just of Humewood Beach used to be the city's dry dock used for boat repairs and service before the harbor was built in the 1930's. These days is doesn't serve any shipping purpose anymore but has become a man made reef attracting fish which in turns makes it a popular spot for scuba divers, spear fishermen and snorkelers. Standing at McArthur pool on Saturday during Ironkids I tried out the zoom lens on my new camera watched some activity on Kings Beach. I was amazed at all the different things happening. 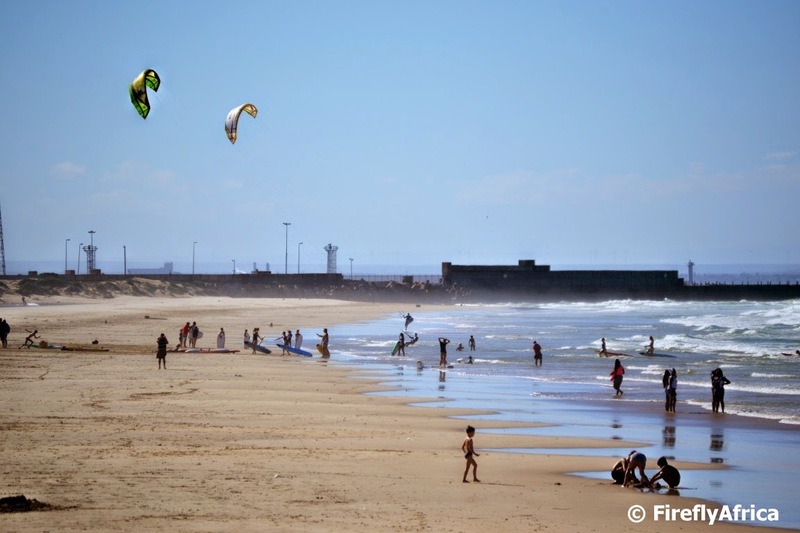 People swimming, a couple of kite boarders, two guys on SUPs, body boarders, knee board paddlers, kids building sand castles, people having a tan and a few folk just going for a walk. All of that with lots of sail boats out in the bay. 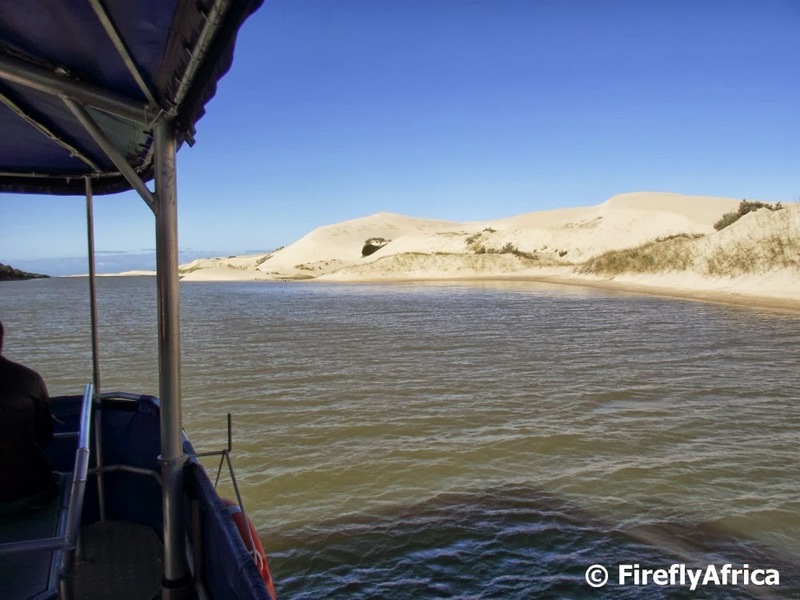 Truly a watersport activity paradise.